Integration of disciplines, theories and research orientations has assumed a central role in criminological discourse yet it remains difficult to identify any concrete discoveries or significant breakthroughs for which integration has been responsible. Concentrating on three key concepts: context, mechanisms, and development, this volume aims to advance integrated scientific knowledge on crime causation by bringing together different scholarly approaches. 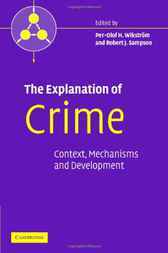 Through an analysis of the roles of behavioural contexts and individual differences in crime causation, The Explanation of Crime seeks to provide a unified and focused approach to the integration of knowledge. Chapter topics range from individual genetics to family environments and from ecological behaviour settings to the macro-level context of communities and social systems. This is a comprehensive treatment of the problem of crime causation that will appeal to graduate students and researchers in criminology and be of great interest to policy-makers and practitioners in crime policy and prevention.